I vaguely recall that question but not more that that. However, I don't understand why I'm getting +2 for its removal. I'm not clear why it's been removed. And I definitely wish to see its contents to refresh my memory. Please note that I have no objections to it being removed. I'm just very curious why stuff happens, especially if it's unexpected and when unable to explain myself. You can find this by yourself in the Question list. At the bottom of the page. Goto your profile -> Questions Section -> Then at the bottom you will find a link called Deleted Recent Questions. I have tried to create the link for your profile. I hope you will be able to access it just by clicking on it. Each of the above reason have more specific criteria for deleting a question. 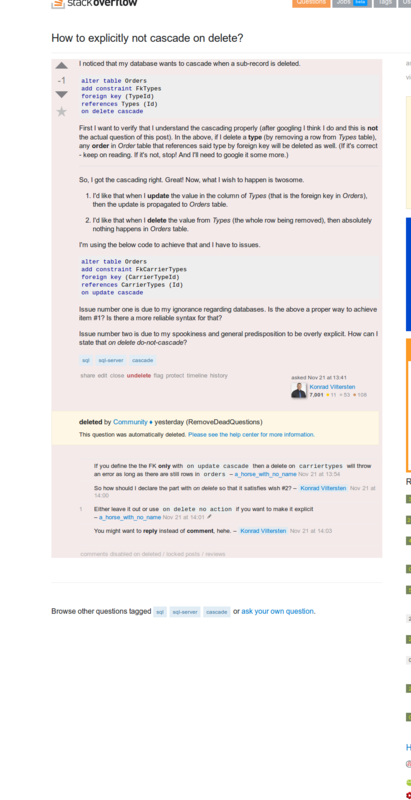 You can find it here: The Community user deleted my question! What gives? How long is deleted question stored? How to know the reason of deleted question?